Why Ship Freight With Direct Supply? Direct Supply works with you to build a custom shipping solution that gets your products where they need to go – on time and within your budget. Our goal is to provide you with the equipment, products, drivers, and trucking options you need to get the job done all in one place. That includes everything from pallets and packaging all the way through to delivery of your product. LTL, or “less than truckload” shipping, refers to a shipment that doesn’t fill an entire truck. For non-business consumers, LTL trucking is used many times for one-off, large item orders, like shipping a crated car engine across the country. In this example, a car engine is large and heavy enough that it wouldn’t be able to be shipped using common parcel logistics methods, like FedEx 2Day or UPS Ground. On the other hand, the buyer doesn’t need to reserve an entire box or semi truck for just one engine – that would be prohibitively expensive, and quite wasteful! Instead, the buyer can coordinate a LTL shipment with a trucking company. The trucking company coordinates its shipments to determine when there will be enough space on his truck to fit the crated engine (based on the dimensions of the crate), and what his route plans look like, to try and fit the most cargo in the trailer while making the most efficient use of fuel in his delivery journey. The trucking company then provides shipping options – pickup date, delivery date, and cost – to the buyer. The buyer pays the trucking company, a pickup is scheduled at the seller’s location, and the parcel is picked up and delivered according to plan. This same general LTL delivery concept also applies to businesses. The main difference is that when a business ships LTL, there’s typically more than one box, pallet, or crate involved. For an example of how a tool making business would use LTL, let’s assume this business needs to ship 12 pallets full of hammers across the country. Since 12 pallets don’t equal a full truckload (FTL), a LTL trucking company can ship that business’s 12 pallets of hammers along with another business’s 11 pallets of bicycle seats, and possibly a few more crates or pallets from yet another company until the entire truck is full. Since you won’t have to wait until you’ve filled two dozen pallets worth of orders, LTL shipments can get to their destination faster, which generally makes customers happy. Your smaller parcel load can be shipped for a fraction of the cost versus hiring an entire truck (FTL). Why Use FTL (Full Truckload) Freight Transportation Services? If you can fill a whole truck with your products, your goods are more likely to reach their destination faster than if you had shipped them LTL as there are fewer steps in routing. With FTL, you’re reserving an entire truck just for your products. Your goods are kept together on the same truck/container from point A to point B. That means high value items are less likely to get lost during the more complex routing of an LTL delivery. Review the graphic below for an approximation of how many pallets each size truck can hold. Keep in mind that the amount of pallets/crates a truck can hold depends entirely on the dimensions of the pallets, what kind of product is on the pallets, how the pallets are bound together (see: stretch film), and whether the pallets can be stacked. 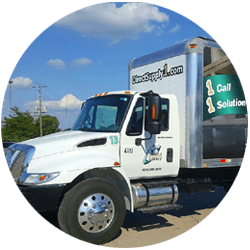 Take advantage of Direct Supply’s freight transportation services! 1 Call, 1 Solution: Your 1 Source for Pallets, Packaging, and More. Request a quote today!